It might be Dec. 29th, but my mind is already wandering to next year in a way. Room 10 is decorated in a patriotic theme due to the fact that we study US History red/white/blue decor is often on clearance, but I’m itching to change it up a bit this summer. 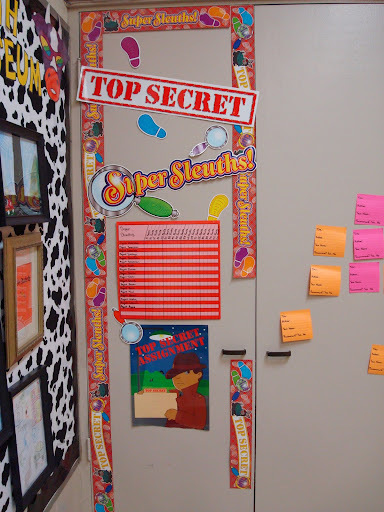 I’m going to do several posts over the next month brainstorming decor and theme ideas in the classroom-pin them for inspiration this summer! 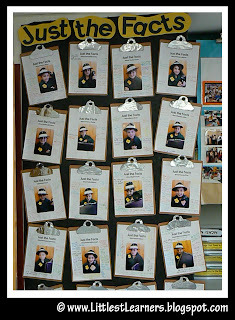 A few years ago, I taught third grade and decided to do the main part of my classroom in a detective theme. The tie-in is perfect: students are investigating, inferring, finding clues and drawing conclusions all the time in their academic work-why not make it like a fun game while they’re at it? To add more realism to the adventure, classroom decor can reflect the air of mystery. To be honest, there really isn’t a lot of pictures featuring detective themes on the web right now! These are the best I could find, including a few of my own. You can also check out our Pinterest board for more ideas. I used Caught Reading posters from the Association of American Publishers website. 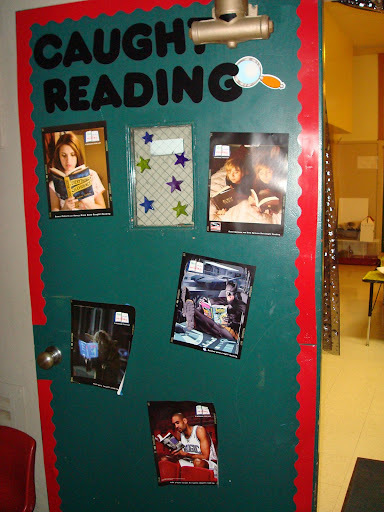 I later took pictures of my students reading and filled the door with their photographs. This was our Mastery Club area, inspired by Mrs. Renz.